CLIMATE change. Greenhouse gases. Fish farms. Palm oil production. Pesticides. Overpopulation. Overconsumption. Plastic waste. What do all these global environmental challenges have in common? They are all well known, they are grave and in need of our urgent attention. And they make us feel helpless. What can we possibly do, as individuals facing such a magnitude of adversity? And mind you, I haven’t even mentioned ocean acidification, general deforestation, genetic engineering, overfishing, acid rain and our very Malaysian phenomenon of the annual haze. Climate change seems to be a somewhat fuzzy eco-warrior’s cry. Yet, the rainy season is no longer as clearly defined as it used to be. Too much meat consumption is enabling greenhouse gases. Yet we like our satay sticks, tandoori chicken and beef rendang. And low-carb, high protein diets are a girl’s best bet for a beach body. We had only just agreed that farming fish for consumption is better than to deplete the already strained wild fish populations, and saves turtles and dolphins from the hazards of unintentional catches. Yet fish farms destabilise the ecosystem. Palm oil production is vastly contested the world over. Alas, this industry provides countless and dearly needed employment opportunities in rural areas. Plus, it is unavoidable as it is not only present in food but in packaging, cosmetics, detergents and all sorts of everyday products. Pesticides kill pollinators like bees and otherwise useful insects. They cause cancer and they poison our food. Yet organic food is still way too expensive for most households to be considered a feasible alternative. Overpopulation is a very sensitive subject. Should we submit ourselves to a self-enforced, worldwide one-child policy? It didn’t exactly go too well in China, did it? Like I said, what can we, as single individuals, do? Even if we are considerate shoppers, consumers and procreators, we feel like we will hardly make any impact at all. Are you depressed yet? Sorry for that, I didn’t mean to ruin your day. There is something we can all do, however. We can easily curb our plastic waste. And the good news is, it won’t even impact our comfort. We all remember our shock when a massive floating island of plastic waste was discovered in the Pacific Ocean. 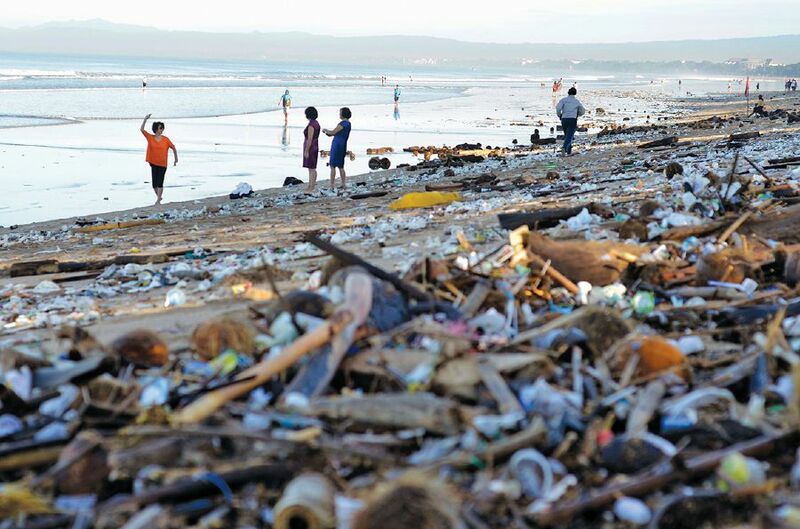 We watched in horror as pictures of whales and sea birds with stomachs full of plastic hit our social media timelines. We are disgusted as we stroll along the beach and find way more plastic trash than seashells. Oh, and by the way, need I mention the habit of hanging little plastic bags of leftover teh tarik on tree branches by the roadside? This one is almost as iconic to Malaysia as the mat rempit wearing his jacket backwards. Plastic production and its waste management is one area where we can all make a difference. Plastic is a reality in our daily life, there’s no way around it, not yet anyway. By the time we leave for work in the morning, we would have touched plastic a few dozen times already. Toothpaste, toothbrush, shower gel, toilet seat — you get my drift. The real culprit, however, is the so-called single use plastic. Grocery bag, water bottle, cling wrap, food containers, cutlery, coffee stirrers and cup lids, plastic straws. All these items are either unnecessary or have replaced a perfectly good, reusable alternative made of cloth, glass, porcelain, metal or, well yes, straw. Next time you carry your groceries to your car, consider how grateful you are that your cloth bag won’t rip and spill your goods all over the parking lot. Next time you indulge in a fine meal, notice how you savour it being served on a fine porcelain plate. Next time you enjoy a pre-dinner cocktail, think about how much better it tastes when served in a real glass. And, like me, order that drink without a straw. Let yesterday’s refreshment be the one you sipped from your last straw.